These are lyrics by Alice Cooper that we think are kind of nonsensical. 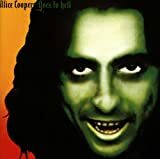 Alice Cooper's, "Feed My Frankenstein"
First off, what does being evil have to do anything with being good looking? You don't need fires, we have stoves now. You don't want pizza? Then quit complaining and make something else to eat. Bring you to a simmer? Wow, freakin cannibal. Run my greasy finger down your greasy spine? First off why are you both greasy? Looks like you need to take a wash BEFORE you do it. Second, I don't want your fingers on my back, if you catch my drift. Hmmm, let's analyze this. Poison means venomous substance. So someone's lips are poisonous poison. Welcome to the department of redundancy department. School CAN'T be out forever! It might be over for you, but what about everyone else? People need somewhere to learn, you know.